Engineers test a four-metre-tall humanoid manned robot dubbed Method-2 in a lab of the Hankook Mirae Technology in Gunpo, south of Seoul, on December 27, 2016. 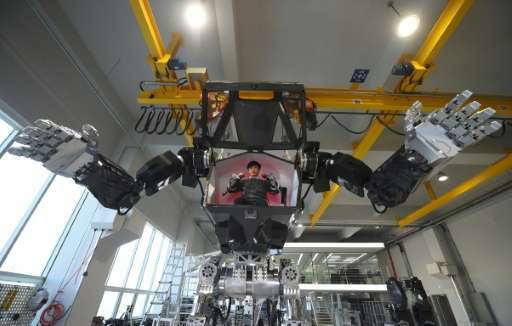 The giant human-like robot bears a striking resemblance to the military robots starring in the movie "Avatar" and is claimed as a world first by its creators from a South Korean robotic company. 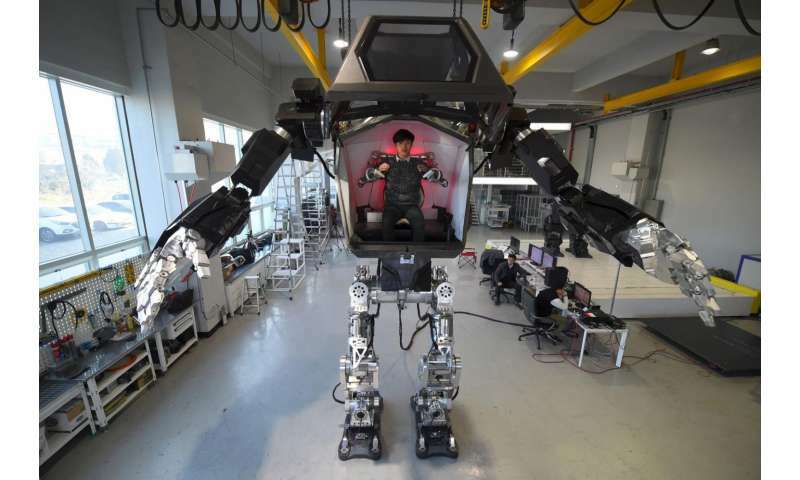 A giant South Korean-built manned robot that walks like a human but makes the ground shake under its weight has taken its first baby steps. Designed by a veteran of science fiction blockbusters, the four-metre-tall (13-foot), 1.5 ton Method-2 towers over a room on the outskirts of Seoul. The hulking human-like creation bears a striking resemblance to the military robots starring in the movie "Avatar". It is claimed as a world first by its creators at Hankook Mirae Technology, a South Korean robotics company, where about 30 engineers were hard at work conducting initial tests Tuesday afternoon. "Our robot is the world's first manned bipedal robot and is built to work in extreme hazardous areas where humans cannot go (unprotected)," said company chairman Yang Jin-Ho. A pilot sitting inside the robot's torso makes limb movements which are mimicked by Method-2, whose metal arms each weigh 130 kilograms (286 pounds). The robot, more than twice the size of a tall man, is so heavy that it shakes the ground when it takes a step with a loud whirring of motors. Yang, who dreamed as a child of building his own robot, said he has invested 242 billion won ($200 million) in the project since 2014 to "bring to life what only seemed possible in movies and cartoons". Building the giant robot was a challenge for the engineers—most of them in their mid and late 30s—as its unprecedented scale meant they had nothing to refer to, said one who declined to be named. So far, it remains unclear how the robot will be used. Method-2 is seen more as a test-bed for various technologies that will allow the creators to build any type and size of robot in future. While its enormous size has grabbed media attention, the creators of Method-2 say the project's core achievement is the technology they developed and enhanced along the way. "Everything we have been learning so far on this robot can be applied to solve real-world problems," said designer Vitaly Bulgarov on his Facebook page. He has previously worked on film series such as Transformers, Robocop and Terminator. Yang said they have already received inquiries from industries ranging from manufacturing and construction to entertainment. There have even been questions about its possible deployment along the heavily fortified Demilitarized Zone with North Korea. But the robot, tethered by a power cable and still a bit wobbly on its feet, is far from finished. More work is needed on its balance and power systems, according to its creators. "The robot is one year old so it is taking baby steps," Yang said. "Just like humans, it will be able to move more freely in the next couple of years." He said the robot will be ready for sale by the end of 2017 at a price of around 10 billion won ($8.3 million). This is not a military purpose. Korea Future Technology Representative said in Korean broadcast interview. The robot has plans to use it as a disaster-oriented robot later on. Some people only focus on specific areas.. I am Korean.. So I know the content better .. I know this robot will be used for various purposes in the future. To be honest, If the United States released this robot, there would be a lot of favorable articles..
On some media, this robot is focused solely on military purposes.. I do not understand that point. This is so cool, not so much the robot itself, but that the creators just wanted to do it, to make the dream of so many into a reality. A robot with "legs" is only really useful in an environment where legs offer advantages. I would like them to work towards a robot with wheels also, kind of like a "robot with roller-skates". This would bring many advantages, and versatility that would have value. Hopefully we can get a power source for all these exo-suits and robots. What we can build is great, but the real and ever-present problem of Powering the thing, continues. I seriously doubt that it would be of any use. Why use an humanoid if you can use a proper bulldozer? You mean something like a vehicle with wheels and governed by two joysticks? Doesn't sound too "robotish" or original to me. In fact the only reason for calling this humanoid thing a "robot" and not an exoskeleton or just a vehicle is that it resembles the idea of a robot from the sci-fi. But IMHO a proper robot should be autonomous. I would rather call it a "mecha" as this is what it is. I disagree. The country of origin doesn't really matter and South Korea actually ranks pretty high in technological credibility. It's just that the robot is not much more than an expensive gadget. Pretty cool and good for what it is: Being a "proof of concept" for a design and an excellent project for engineering students but just not usable in the real life. Regarding the "military" focus: I assume that the people who wrote these articles aren't too technically savvy: Put such a huge piece of metal on a battleground, it would last seconds before they blew it to pieces, even if it were perfectly functional and had the armour of a main battle tank. a bulldozer does not have hands therefor cannot do things precise and delicate. As far as military use, it would rank low because a sniper can take it out with a 50 caliber rifle at an easy 200 meters. But put oxygen / water tanks on it and it would be very useful to fight large forest fires.